Research on the unconscious mind has shown that the brain makes judgments and decisions quickly and automatically. It continuously makes predictions about future events. According to the theory of the “predictive mind,” consciousness arises only when the brain’s implicit expectations fail to materialize. Higher cognitive processing in the cerebral cortex can occur without consciousness. The regions of the brain responsible for the emotions and motives, not the cortex, direct our conscious attention. In 1909 five men converged on Clark University in Massachusetts to conquer the New World with an idea. 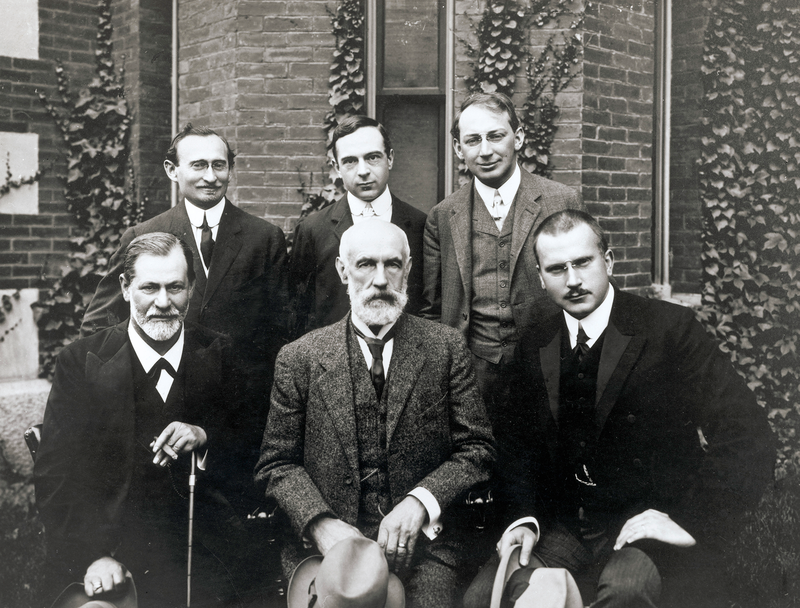 At the head of this little troupe was psychoanalyst Sigmund Freud. Ten years earlier Freud had introduced a new treatment for what was called “hysteria” in his book The Interpretation of Dreams. This work also introduced a scandalous view of the human psyche: underneath the surface of consciousness roils a largely inaccessible cauldron of deeply rooted drives, especially of sexual energy (the libido). These drives, held in check by socially inculcated morality, vent themselves in slips of the tongue, dreams and neuroses. The slips in turn provide evidence of the unconscious mind. At the invitation of psychologist G. Stanley Hall, Freud delivered five lectures at Clark. In the audience was philosopher William James, who had traveled from Harvard University to meet Freud. It is said that, as James departed, he told Freud, “The future of psychology belongs to your work.” And he was right. The view that human beings are driven by dark emotional forces over which they have little or no control remains widespread. In this conception, the urgings of the conscious mind constantly battle the secret desires of the unconscious. Just how rooted the idea of a dark unconscious has become in popular culture can be seen in the 2015 Pixar film Inside Out. Here the unconscious mind of a girl named Riley is filled with troublemakers and fears and housed in a closed space. People like to think of the unconscious as a place where we can shove uncomfortable thoughts and impulses because we want to believe that conscious thought directs our actions; if it did not, we would seemingly have no control over our lives. This image could hardly be less accurate, however. Recent research indicates that conscious and the unconscious processes do not usually operate in opposition. They are not competitors wrestling for hegemony over our psyche. They are not even separate spheres, as Freud’s later classification into the ego, id and superego would suggest. Rather there is only one mind in which conscious and unconscious strands are interwoven. In fact, even our most reasonable thoughts and actions mainly result from automatic, unconscious processes. A revolutionary, and now widely accepted, countermodel to Freud’s scheme goes by the term “predictive mind.” The theory comes in different flavors, but overall it holds that automatic processes play a central role in the mind, allowing us to predict events quickly and accurately as they arise. Learning, experience and consciousness constantly improve our implicit, or unconscious, predictions, and we take note of events only when the predictions fail. That is, we become conscious of circumstances when they merit our attention. This automaticity enables us to function smoothly in the world, and becoming conscious when predictions fail enables us to avoid the pitfalls of automatic processing and adjust to changes in our environment. In a simplified example, unconscious processes predict the trajectory of a ball tossed to us and adjusts our limb motions accordingly. Conscious processing would become engaged, however, if the ball took a sudden right-angle turn. Like the popular conception of the embattled mind, the predictive mind perspective is rooted in 19th-century precursors. Physicist and physiologist Hermann von Helmholtz was the first to hypothesize that the conclusions we arrive at automatically are anchored in perception. 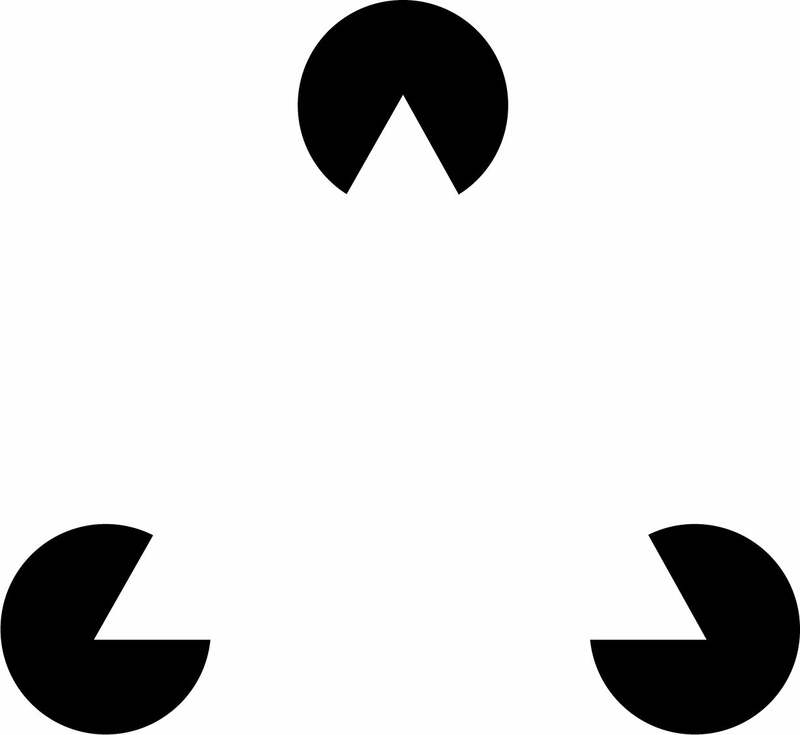 Our visual system, for example, readily produces an imaginary triangle out of three strategically placed circles with slices cut out (illustration). According to Helmholtz, such useful illusions proved that preprogrammed mechanisms shape our image of the world without our doing anything at all. The predictive mind model now hypothesizes that this automaticity shapes not only our perceptions but all mental processes, including our judgments, decisions and actions. To physically function smoothly in the world, you need your brain to quickly and automatically distinguish between the body’s own actions and external inputs. It accomplishes this feat by creating a so-called efference copy of each command it sends to muscles. When you shake your head back and forth, for example, you know that the external world is not rocking back and forth even though the visual cues reaching the brain might give that impression, because the efference copy indicates that the brain itself gave the motion commands. The efference copy is also the reason you cannot create the same tickle sensation in your own foot that others can induce: when the tickling sensation at the sole of your foot is processed, the areas of the brain responsible for perception of touch are already well informed that your own fingers are doing the job. The workings of unconscious processes are also evident in a wide variety of other phenomena, such as automatic movements, spontaneous associations, jumping to instant conclusions (an example of what scientists call “implicit inferences”) and perception of subliminal stimuli (those not consciously recognized). Laboratory experiments have shown that test subjects recognize the rule underlying a particular task before they are able to verbalize the rule. In one study design, for example, volunteers are asked to draw cards from two stacks, one that could bring huge hypothetical profits but also massive losses and one that is less risky; the volunteers are not told of the difference between the stacks. Signs of stress, such as increased sweating, will reveal that the subjects sense the pattern—the difference between the stacks—long before they can articulate that one of the piles is risky. As neuroscientist Nicolas Schuck of the Max Planck Institute for Human Development in Berlin has recently demonstrated, such implicit inferences affect activity in certain parts of the frontal lobe—where decisions are often said to be made—even before the test subjects make their decisions. Research using a subliminal intervention called priming provides further examples of the ways unconscious processing influences behavior. Experimenters present images, words or even physical sensations in such a way that test subjects either will not notice the stimuli (because the exposure is too brief) or will disregard them (because they presumably have nothing to do with whatever is being focused on). In an example of the latter strategy, psychologists may ask subjects to read texts in which certain words appear multiple times without the words being highlighted and ask control subjects to read a neutral text. If the test subjects display measurable differences in thinking, feeling or acting after reading the text with multiple occurrences of the word, researchers can assume that the text had an unconscious effect. Numerous studies have demonstrated that subliminal stimulation involving concepts such as aging or death have measurable consequences on behavior. Test subjects move more slowly, for example, or become more responsive to spiritual ideas. The phenomenon is familiar in everyday life. Passing a bakery, people may suddenly remember that they forgot to get the ingredients for a birthday cake. Our unconscious paves the way for our actions. Such examples confirm that the brain functions along multiple tracks. Compared with a computer, our gray matter chugs along very slowly—but on many parallel levels. Researchers often distinguish between two general strands, however. Nobel laureate in economics Daniel Kahneman calls them System 1 and System 2. Others speak of implicit and explicit or hot versus cold processing. The first strand (System 1, implicit, hot) refers to the rapid, automatic and uncontrollable workings of the unconscious mind; the other strand (System 2, explicit, cold) describes the slow, more flexible conscious processes that are subject to volition. But what is key in the predictive mind conception of mental functioning is that these two strands always work in tandem; in other words, our mind operates both unconsciously and consciously. The following sentences illustrate the truth of this assertion: Veery nmoral sopern acn dpeciher eseth drows. Talhoguh het telters rae ramscbled, ouy houlsd vahe on ficudiflty unstanddering thaw si geibn dias. Ouy anc od hist ecabuse fo het sursingpri mautoaticity fo het brian! Most people will take only a fraction of a second to become aware of what the next word must be. The autopilot in our brain anticipates the words and quickly sorts the scrambled letters. A big riddle is what precisely distinguishes conscious from unconscious processes at the neurophysiological level—and how exactly they interact. According to philosopher Peter Carruthers of the University of Maryland, College Park, we are aware only of the material in our working memory: the “user interface,” so to speak. But working memory holds only a vanishingly small fraction of the data we take in. We remain unconscious of most of the input that floods the brain—and feeds System 1, which processes it automatically and quickly. What does the brain do with these data? It constantly peers into the future, considering, What will happen next? What stimuli are likely to come up? Anything dangerous on the horizon? What are others up to? Such prognostications relate not only to the outer world but to the internal milieu of our bodies. Seen in this light, our desire to eat is nothing more than the unconscious anticipation of an impending loss of energy. Our unconscious aims to maintain homeostasis, to keep our body (including the balance of energy intake and use) in a steady state. Solms described this idea in a 2018 paper co-authored with Karl Friston of University College London, a key figure in the development of the imaging techniques that have so revolutionized brain research. About 10 years ago Friston introduced the free energy principle, a mathematically formalized version of the theory of the predictive brain. In his definition, free energy in the brain describes the neuronal state that results from the brain’s failure to make a correct prediction; the brain does all it can to avoid free energy. In the final analysis, Solms and Friston assert, predictive errors equal surprise equals consciousness; when things do not work as expected, we get consciousness—a state the brain tries to limit. This perspective not only stands Freud’s theory on its head, but it also contradicts the classic view that the cortex (the outer layer of the cerebrum) is the source of consciousness. According to Solms, these higher regions are not the bearers of consciousness but instead are “told” what to attend to by deeper structures in the brain stem and midbrain. 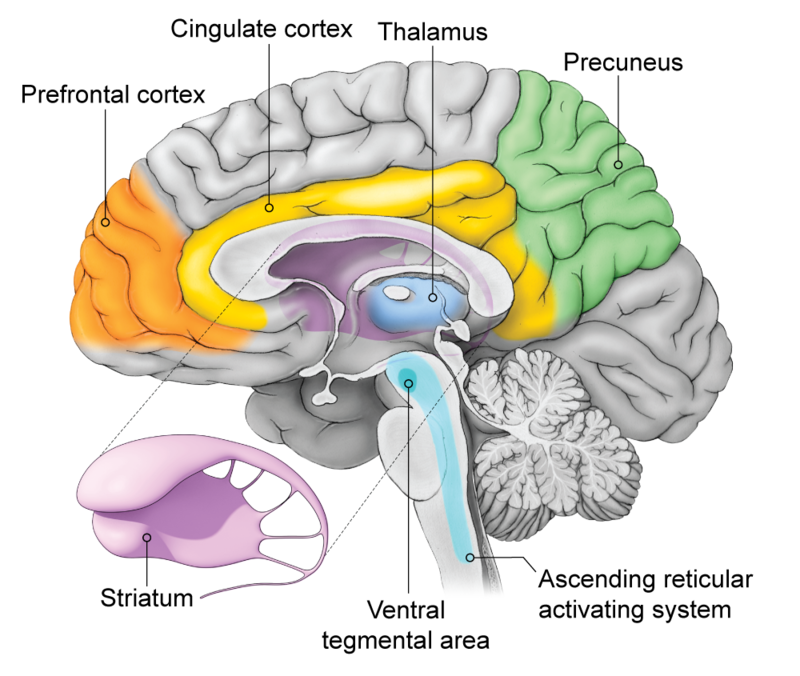 Solms locates the source of consciousness in the areas of the brain that regulate alertness, emotional stimulation, and drives—precisely those areas where Freud located the unconscious (brain illustration). “The pattern-detection mechanisms of the cortex work most efficiently without conscious attention. It is the deeper, emotional parts of the brain, the limbic structures, from which consciousness arises,” he says. This hypothesis can be empirically confirmed. Children who as a result of developmental disorders were born without a cerebral cortex are capable of forms of consciousness, for example. Such infants, if they survive into childhood, are not only alert but display emotional reactions. In a 2007 review, neuroscientist Björn Merker concluded that numerous conscious phenomena occur even without a cerebral cortex. Although more complex mental operations such as logical thinking or self-reflection are not possible, emotions such as joy, annoyance or sadness can be experienced. Many people stubbornly cling to the old distinction between the instinctive unconscious and rational consciousness, with a preference for the latter. But, as I have shown, this view is untenable. Unconscious processes greatly control our consciousness. Where you direct your attention, what you remember and the ideas you have, what you filter out from the flood of stimuli that bombard you, how you interpret them and what goals you pursue—all these result from automatic processes. Timothy Wilson of the University of Virginia considers this reliance on the unconscious to be the price that we pay for survival as a species. If we were forced always to consider every aspect of the situation around us and had to weigh all our options about what to do, humankind would have died out long ago. The autopilot in our brain—not consciousness—makes us what we are. The real mastermind that solves problems and ensures our survival, then, is the unconscious. It is understandable that people tend to distrust the unconscious, given that it seems uncontrollable. How are we supposed to be in control of something when we do not even know when and how it influences us? Nevertheless, the arrangement works. John Bargh of Yale University, who studies priming, compares the human mind to a sailor: To steer a boat from point A to point B, a sailor needs to know the destination and be able to make course corrections. Such abilities are not sufficient, however, because, as is true of the unconscious, uncontrollable factors such as ocean currents and wind come into play. But expert sailors take them into account to arrive at their destination. We do well to treat our unconscious similarly—by not getting in its way. And that is really what we do day in and day out. When I put a picture of my loved ones on my desk to fuel my motivation for work or when I take the stairs instead of the elevator, I am steering my unconscious mind, recognizing that its desires for leisure and rest do not serve my best interests at the moment. And the fact that I am able to do this shows that the conscious and the unconscious are partners rather than opponents. This article originally appeared in Gehirn&Geist and has been reproduced with permission. Consciousness without a Cerebral Cortex: A Challenge for Neuroscience and Medicine. Bjorn Merker in Behavioral and Brain Sciences, Vol. 30, No.1, pages 63–81; February 2007. Medial Prefrontal Cortex Predicts Internally Driven Strategy Shifts. Nicolas W. Schuck et al. in Neuron, Vol. 86, No. 1, pages 331–340; April 8, 2015. Surfing Uncertainty: Prediction, Action, and the Embodied Mind. Andy Clark. Oxford University Press, 2015. How and Why Consciousness Arises: Some Considerations from Physics and Physiology. Mark Solms and Karl Friston in Journal of Consciousness Studies, Vol. 25, Nos. 5–6, pages 202–238; May/June 2018. Steve Ayan is a psychologist and an editor at Gehirn&Geist.